It was our first wedding anniversary. We had planned to visit The Water Witch hall where my lovely wife Judie and I were married, and look out over the water to the NY skyline, but instead I went to the afore mentioned animation seminar. So today we went to Ocean City, NJ, laid on the beach, walked the boardwalk, ate pizza and ice cream and had a blast with our friends John and Fran who were also celebrating their first year of marriage. I had a busy week — I joined ASIFA East (Association Internationale du Film d’ Animation) a fancy french name for the New York metro area animators’ tree fort. The have lots of fun events and a lot of talented and interesting people involved in animation — hurray! Then I joined a life drawing group right here in Red Bank just a half mile from my house. Lucky I don’t have to schlep all the way into NYC to do that. Here’s my first attempt since studying with the master — Tim Gula in Los Angeles 4 years ago. 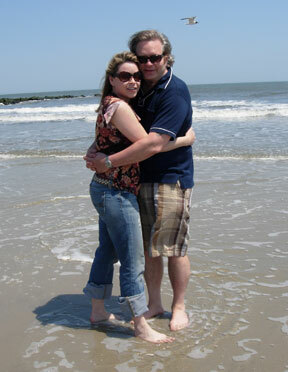 No, those are not Fred Flintstone’s toes at the bottom of the picture– they’re mine. The new Crucial Animation site is almost done — please be patient. Then I went to the SIGGRAPH Animation Boot Camp at the Fashion Institute on Saturday. 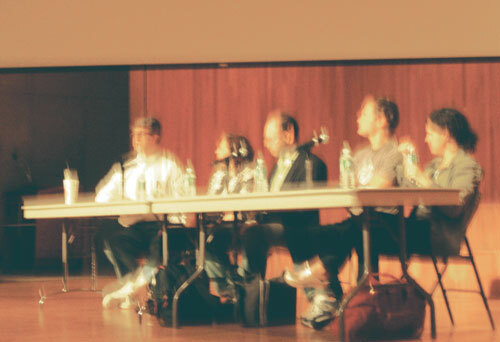 This was a fantastic day of panel discussions featuring a many fascinating people in the animation field in NYC. Among them I met the Frederator himself; Fred Seibert formerly of MTV, Hanna Barbera, and now Next New Network and of course the groundbreaking Frederator podcasts. I also met KAOS Studios’ Luis Cataldi — who makes some really radical video games, and David Levy, the author of Your Career in Animation: How to Survive and Thrive an absolutely essential book for anyone looking to get into the animation business. Luckily Iâ€™m a better drawer than photographer. Fred and company at SIGGRAPH panel. 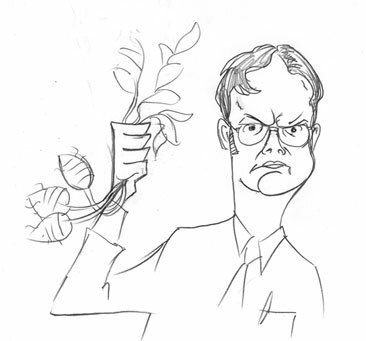 Author adminPosted on May 3, 2007 July 21, 2007 Categories sketches, Television Characters1 Comment on Dwight Schrute Wants Beets! Can A Sandwich Make Better Drawings? I hit a wall sometime after the last post. 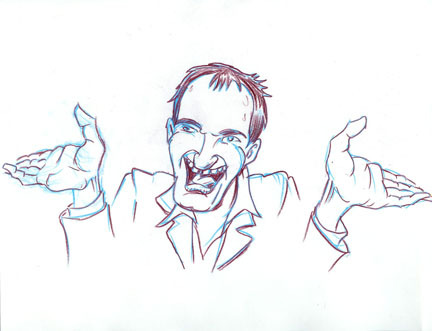 I drew all morning, trying to get Mr. Tarantino’s likeness down. Enlisting different styles: simple, stylized, complex, illustrative, cartoonish, Hirshfeld, Drucker, etc. I was getting worse. A slight improvement, and then a huge slide backwards. Then I noticed my dog wanted to go out — it was noon. Might as well let her out and make a sandwich while downstairs. Although not truly hungry, I knew I would be soon enough. One sandwich later, this drawing appeared. 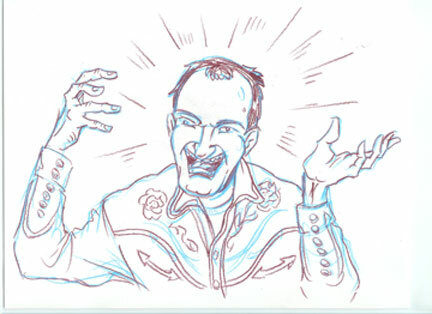 Tarantino explains in great detail everything he does and everything he loves. Here, in one of his patented gestures, he makes points one, two, and three. Author adminPosted on May 3, 2007 May 3, 2007 Categories Movies, sketchesLeave a comment on Can A Sandwich Make Better Drawings? 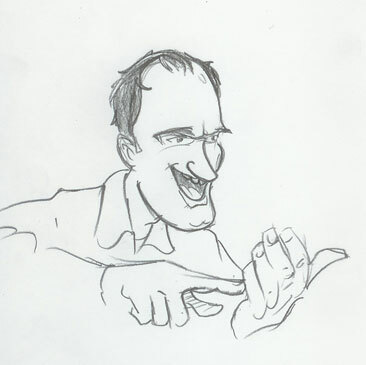 These hands are more expressive. He’s a mad genius. I found him archived on this Charlie Rose Show on Google video. Why do I bother Tivoing anymore? I love him because he’s maniacal. Tarantino exudes passion about film. He’s got so much to say in such a short amount of time. I recently saw him on Charlie Rose and he was infinitely entertaining. Then I saw him on Iconoclasts on Sundance Channel, and he was so animated as he explained in detail about his craft. I saw him one night when I came out of the Archlight Theater in Hollywood, a few months before Kill Bill was released. I loved his films and wanted to go over and speak to him, but I soon realized he was wacked out of his mind on whatever. But there he was, railing against the studio system and anything else you’d want to hear from him. God love him! So far, I’ve only posted Saurus work here — something I’m beginning to rethink. I’ve always compartmentalized everything I’ve created, never wanting to mix the edgier Crucial Comics with the mainstream licensed stuff. Even going as far as to work under a pseudonym. It’s high time I put it all under one roof (or blog). 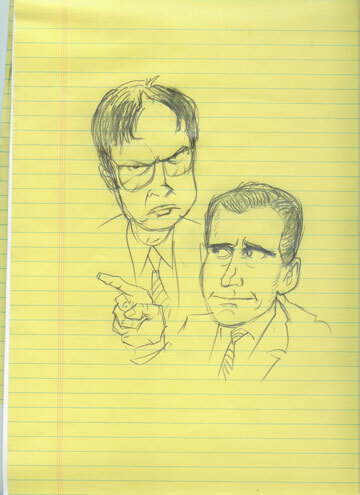 For my first non-Saurus posts, is sketch of Dwight and Michael from “The Office.” I’m working on a series of drawings that depict some of my favorite television characters and personalities. Jeesh — I feel like I’m in high school again. What’s next? My favorite bands? 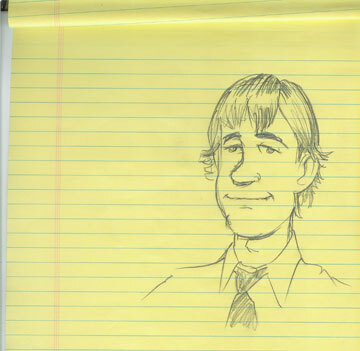 But I make no apologies, I enjoy doing character drawings. 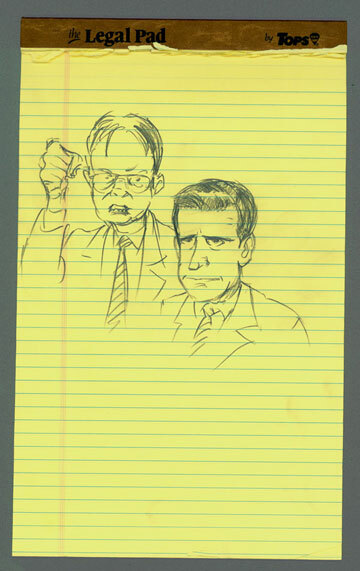 So let the drawings flow.